Whatever I prescribe has to be justifiable and have scientific back-up. I wanted to make you aware of an important cause of fatigue, constipation, memory loss, numbness, that is not so uncommon these days. As B12 is a water soluble vitamin, one can take a lot of B12 and whatever the body doesn’t use that day gets excreted in the urine. It is stored in the liver for example as is Vitamin D or Vitamin A so restoring from a deficient state can take a period of time. Its effect on the body can have secondary effects on the blood, central nervous system, and other organs when not absorbed properly. B12 is found in many foods especially, shellfish, liver, fish, meat, and fortified cereals. Big problem these days is acid reflux. Over 150,000,000 scripts for acid reflux pills were written last year in the US. Countless over-the-counter zantac, prevacid, prilosec, cimetidine pills are also purchased. Now you need to realize that B12 is primarily absorbed in the stomach and not in the small intestine. Here’s the dilemma — In order for that absorption to take place, there needs to be an acid environment. 1. B12 absorption is diminished with age. 2. Frequent alcohol use diminishes the ability to absorb B12. 3. Chronic use of an acid reflux pill reduces acid production in the stomach that is necessary for B12 absorption. 4. Taking high doses of plant derived protein in the diet or being vegetarian risks B12 deficiency. 5. Having stomach bypass surgery risks B12 deficiency. 6. Some individuals may have a genetic predisposition to lower B12. One of the best solutions is to discuss with me Injectable B12 therapy. 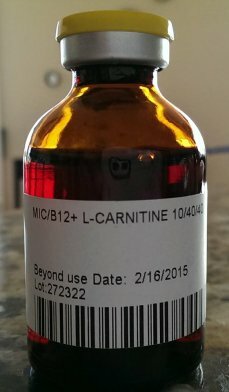 B12 is found in our MIC B12 combo injectable as well as in our Meyer’s cocktail. I can also have it included as a constituent in your HCG therapy.